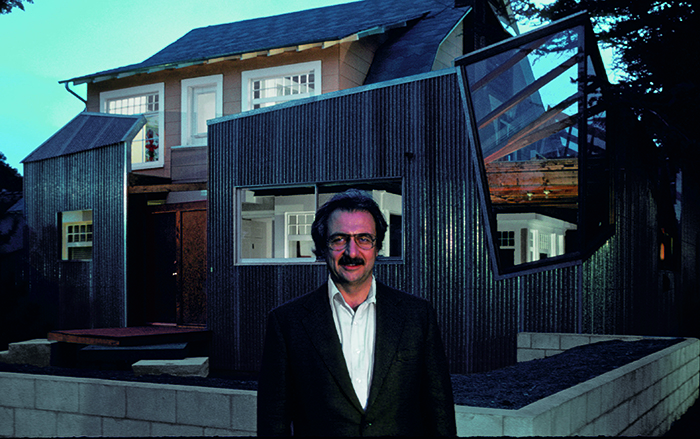 Few architects working today have achieved the notoriety of Frank Gehry. He's designed buildings in his inventive, sculptural style in Paris, Bilbao, Los Angeles and here in Chicago's Millennium Park. Despite his worldwide notoriety, the new book "Building Art: The Life and Work of Frank Gehry" is the first major biography to look at Gehry's long life, complicated personality and singular approach to architecture. Joining us is the author Paul Goldberger. He's a Pulitzer prize-winning architecture critic and a contributing editor at Vanity Fair. He previously worked for The New Yorker and The New York Times. (Gehry Partners LLC) "He had a very, very difficult childhood and a father who he loved, but who was a difficult, proud and unsuccessful man who failed at many, many careers, and took out a lot of his resentment on Frank, kept telling him he was just a dreamer, he would never really amount to anything in a practical way," said Goldberger. "There was a practice among Jews in a certain generation, of a certain time–Eastern European Jews–not just in Toronto but in a lot of places. They would buy a fresh fish and have it swim around in the bathtub for a day or so, and then kill it and turn it into what was called gefilte fish. "He would accompany her to the market and buy this fish, and then watch it when he was a little boy, swimming in the bathtub, and be fascinated by it. The fish became an image in his mind that actually really persisted all through his life and is one of his favorite forms. He's used it and replicated it in many many ways: lamps, even buildings, sculptures and so forth." "It's a wild house," Goldberger said of the house in Santa Monica. "It's a house he did in 1978 with his second wife. It's a fairly ordinary suburban Dutch Colonial house that he then started taking apart and doing crazy things with but didn't obscure completely. The house is almost like a struggle between the past and the present: You see the old house, you see his new style. He used a lot of very ordinary materials but in very different ways. He hung out in those days more with artists than architects. He loved the way the artists of Los Angeles used ordinary things and made collages out of them and different things. He really found that energizing and exciting and he turned it into architecture." "The Disney Concert Hall in Los Angeles started with a $50 million gift from Lillian Disney, Walt Disney's widow," Goldberger explained. "They were very grand, important people and they wanted a very grand, important architect. They held a small competition, but Frank Gehry, who was thought of at that point as kind of an outlier and a slightly crazy, cutting-edge guy who did weird things with plywood and chain link fencing and all that–not elegant and grand–nevertheless came up with a wonderful design. The committee that was charged with making a choice preferred him. “Chicago Tonight” correspondent Elizabeth Brackett interviewed Frank Gehry on Feb. 3, 2000. Watch the interview below. More photos from Gehry's life and work. Below, an excerpt from Goldberger's book. The guest list for the party that Bruce Ratner, a New York City real estate developer, gave in the unfinished 72nd floor penthouse of his new apartment tower in Lower Manhattan on the night of March 19, 2011 was unusual for an event celebrating the opening of a new real estate project. The singer and activist Bono showed up; so did several artists, including Chuck Close and Claes Oldenburg. There were actors like Ben Gazzara and Candice Bergen; the art dealer Larry Gagosian; Harvey Lichtenstein, the longtime head of the Brooklyn Academy of Music, the hotelier Ian Schrager and celebrated journalists like Morley Safer, Tom Brokaw and Carl Bernstein. These and other famous names had not come to get a preview of the steel-clad building, even though it was then the tallest residential tower in the city and the question of what its apartments would be like had been the subject of much speculative talk around town. Neither were most of the guests friends of Bruce Ratner. The celebrities—and about three hundred other somewhat less recognizable people—were friends and acquaintances of a short, somewhat stocky, gray-haired man with glasses, dressed in a black t-shirt and black suit jacket, who spent much of his time standing near the windows on the north side of the penthouse, which had a spectacular view of the Manhattan skyline and the towers of the Brooklyn Bridge. He had designed the building, and he was arguably the most famous architect in the world. project based on Gehry’s plans, Ratner replaced him with another firm and ordered up buildings that were simpler and presumably less expensive than the ones Gehry had designed. Gehry was shaken and angry about the decision, which required him to lay off many of the architects who were working on the project in his office back home in Los Angeles. His frustration was compounded by the fact that he could only express his unhappiness in private, since he was continuing to work on Bruce Ratner’s tall apartment building for lower Manhattan, and he could hardly get into a public spat with him. He seethed inwardly, as he usually did when something did not go as he had hoped. He was not fond of confrontation, and he had generally managed to get his way by being friendly and easygoing, not by acting the role of the temperamental artist. The extraordinary shape Gehry had conceived for Bilbao, a swirling, curving structure covered largely in titanium, inspired the architect Philip Johnson, who toured the museum a few months before its completion, to proclaim it “the greatest building of our time.” It stood as evidence of Gehry’s ability to envision form that had not existed before: exhilarating, robust, and baroque in its richness and complexity. The museum could not be called anything but modern, but it was not your father’s modernism. Its unusual form bore no resemblance to the stark glass boxes that most people identified with modern architecture. crumple up pieces of paper and use the resulting shape as a starting point for figuring out what he wanted to do, his designs were thought by many people to be casual and random. It was the same misconception that people had made fifty years before about the paintings of Franz Kline or Jackson Pollack. Gehry’s buildings were no more the result of accident than Pollack’s drip paintings, and at their best, they possessed a similar kind of strange, new, intense and energetic beauty. Excerpted from BUILDING ART by Paul Goldberger. Copyright © 2015 by Paul Goldberger. Excerpted by permission of Knopf, a division of Penguin Random House, LLC. All rights reserved. No part of this excerpt may be reproduced or reprinted without permission in writing from the publisher.